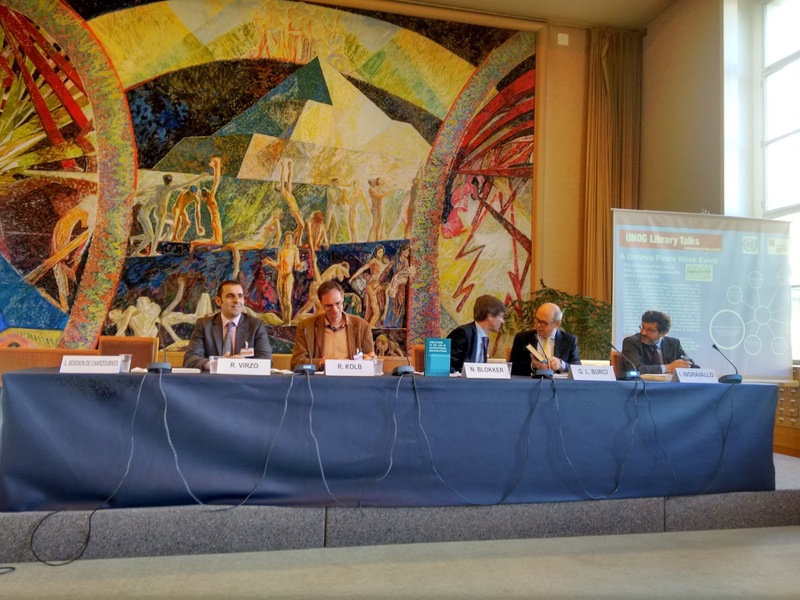 On November 18, 2015 the human rights office assisted to the panel discussion “The Evolution of the Role of International Organizations in the Maintenance of Peace and Security on the 70th Anniversary of the United Nations”, organized as part of the Geneva Peace Week 2015 in the UN Library. The panelists were Ivan Ingravallo, Associate Professor of International Law, University of Bari Aldo Moro, Italy, Robert Kolb, Professor of Public International Law, University of Geneva, Roberto Virzo, Associate Professor of International Law, University of Sannio, Italy and Gian Luca Burci Legal Counsel, World Health Organization and Adjunct Professor of Law, Graduate Institute in Geneva. The discussion was moderated by Niels Blokker, Professor of Institutional Law, Leiden University, Netherlands; former Deputy Legal Adviser, Netherlands Ministry of Foreign Affairs. Robert Kolb opened the panel with a presentation about the evolution from the League of Nations to the United Nations. Mr. Kolb stated that although the main objective of the League was it to prevent wars through a system of collective security, its efficiency in this field remained very week. Compared to this former organization, the United Nations represent an important shift thanks to its stronger collective security system and strengthened institutional and multilateral approach. Ivan Ingravallo talked about the relationship between women, peace and security. In the last years there has been an increasing number of UN resolutions concerning this topic but its implementation is very slow. There are just few national action plans to promote women participation and leadership in peace and security processes and the presence of women in peace-building operations is still very low. Gian Luca Burci focused its speech on the relationship between health and, peace and security. He described the vicious cycle that starting from diseases leads to poverty, inequality and ends up in violence, concluding that health has a high conflict potential. In addition, Mr. Burci defined health as a “humanitarian imperative” explaining that the World Health Organization (WHO) always continued its work in countries drenched in violence as Afghanistan or Myanmar while other UN-Organisms left. Roberto Virzo presented as co-editor the book “Evolutions in the Law of International Organizations” explaining that evolution does not necessary mean a positive step forward but rather an adaption to a new situation that requires new strategies and solutions. Reacting to some questions from the public, Mr. Kolb stressed the presence of different powers within the UN systems and the fundamental task of the “big powers” in pushing forward new changes to establish peaceful societies. A first step forward, added Mr. Blokker, could be the newly proposal by the French government following the terrorist attacks in Paris last Friday, to abolish the veto right within the Security Council when humanitarian interventions are discussed. As we can see, concluded the moderator, evolutions are important and they happen but they need time, especially within complex and broad political systems as the UN.